The ultimate storage headboard is great for a boys room. 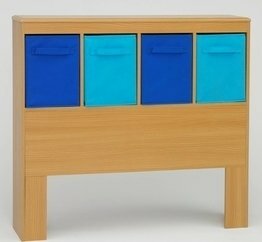 This large twin headboard is any kids dream with storage for games, hand held gaming machines right at their fingertips. The headboard surface is vacuum formed with gently rolled edges. This durable PVC laminate makes this item a great choice for any child's room. The navy and light blue tall folding canvas drawers rest gently on the shelf and have canvas handles on both sides of the drawer for removing, or pulling completely out and taking with you to another room in the house. Constructed of composite board and highly durable PVC laminate. Clean with a dry non abrasive cloth. Assembly required.